Oil and gas exploration is experiencing revolutionary change. The advent of lateral drilling and multi-stage fracking, along with other technological innovations, is resulting in an explosion of attractive new plays. E&P companies are currently racing competitors to evaluate prospective opportunities and acquire attractive acreage. As the industry recovers from the current slowdown, evaluation periods will shorten and workloads increase, most likely with smaller teams due to recent restructuring. To prepare for this new world of more rapid decision-making, energy companies must turn to databases and digital technology to help meet this challenge. It is critical that exploration teams do not use vital time gathering or generating the data needed, but rather spend it interpreting the required data and implementing the interpretation. GeoMark’s Rock & Fluid Database (RFDbase), the portal through which customers access the company’s repository of geochemical data, contains analyses on more than 300,000 source rock, oil, gas, and PVT samples throughout every major producing basin in the world. Geochemistry, along with a myriad of other technical disciplines, is an example of an exploration component that is ideally suited to a database solution. A tremendous amount of high quality geochemical data have been generated during the past 40 years, and much of it is available, although not necessarily easily accessible or quality controlled. Though always an input in conventional drilling, geochemistry has been elevated to a key role in the process of understanding unconventional plays. More than any other science, geochemistry provides insight for unconventional players into the depositional environment, volume and type of organic matter that was deposited, and, most importantly, the thermal maturity history that determines the extent to which kerogen has transformed into volumes of oil and gas. While individual types of data can be used to tell the geochemical story, we have found that it is the convergence of multiple types of data that combine to tell the full story of a particular play. Geochemistry can provide tangible benefits in a multitude of ways, as the following case studies demonstrate. 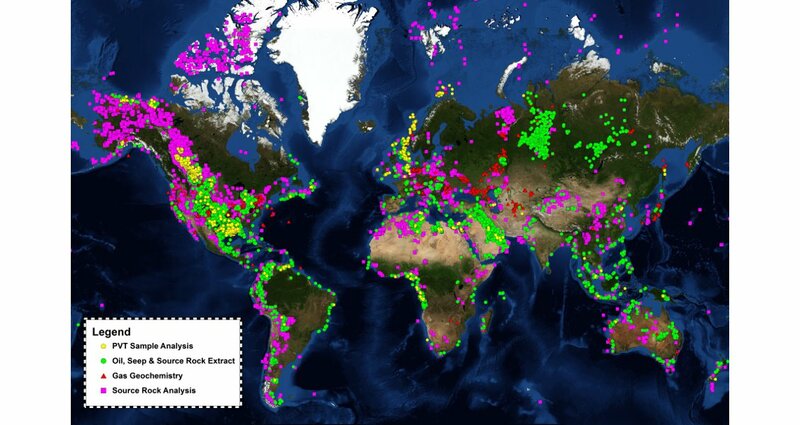 Geochemical data should be an important part of any regional study. In 2007 GeoMark studied the source potential of the Appalachian Basin in the north-east United States. Although the Devonian section was the prime target for this project, it also mapped the potential of the Ordovician sources, and thus identified an organic-rich region of north-east Ohio within the Utica/Point Pleasant Formation that had excellent hydrocarbon potential. The companies that participated in this study were some of the first leaseholders to enter the play. In unconventional plays pressure/volume/ temperature (PVT) data can be mapped to provide regional indications of zones of best production. Undersaturation is the difference between reservoir and saturation pressure. High reservoir pressures provide a strong driving force for production and low saturation pressures keep the fluids in a single-phase condition longer. 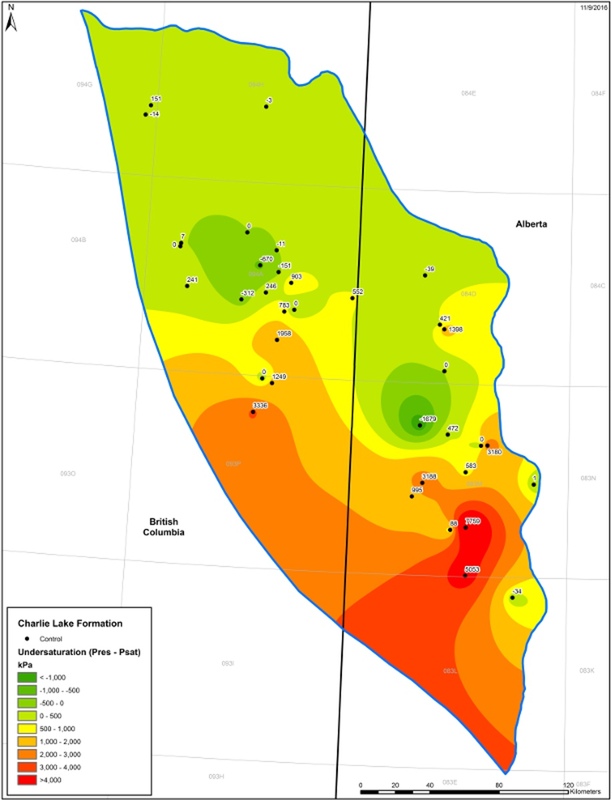 The map (opposite) shows the undersaturation levels across the Triassic Charlie Lake Formation in the Western Canada Sedimentary Basin (WCSB). Zones of best production (orange and yellows) can be distinguished from zones with diminished production (greens). Once the data from a set of PVT reports are standardized and QC’d, regional predictions of phase behavior character are possible in both unconventional and conventional plays. A quick assessment of the overall thermal history of a basin can be made from crude oil biomarker ratios. The maturity of an oil sample reflects the source rock maturity when the oil was expelled. In unconventional resource plays, the success often depends on the level of maturity of the source rock (which is also the reservoir rock): low maturity has a much higher risk than higher maturities since at higher ones, gas is co-generated which provides more reservoir energy for successful light oil production rates. 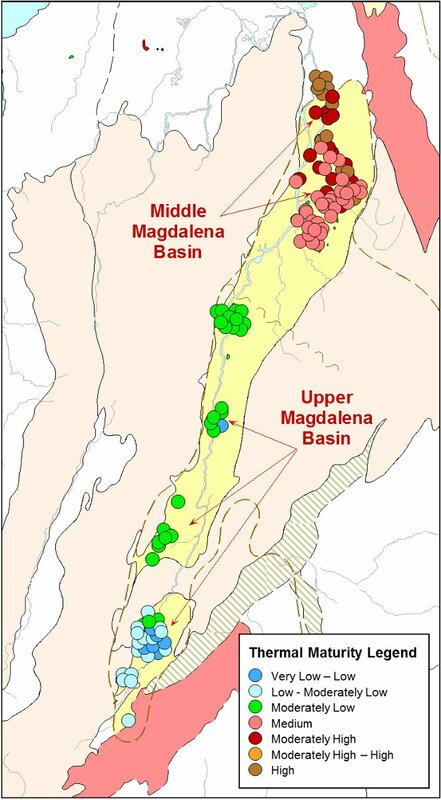 In the search for optimal unconventional acreage in Colombia’s Magdalena Valley, known to contain a world-class Cretaceous source rock (La Luna Formation), it was quickly determined from GeoMark’s global crude oil database that 50% of the La Luna-sourced oil from the Middle Magdalena Formation was from moderate to high maturity organic matter, while 95% of the oil in the Upper Magdalena was of low maturity and at high risk for unconventional production problems. Mapping of the oil maturity within the Middle Magdalena revealed potential ‘sweet spots’ of higher maturity. As the case studies outlined here illustrate, geochemical data are highly useful for the evaluation of both unconventional and conventional plays. However, very few E&P companies treat geochemistry data as a corporate asset. From conversations with mid-cap to large-cap E&P companies, a consistent trend is the absence of a centralized geochemical database that is quality checked, digitized, and easily queried so that data can be identified, selected and efficiently integrated into analytical packages. Too often large swaths of companies’ historic analyses remain undigitized, either in store rooms of paper or as PDFs that are digitized yet entirely unsearchable. Many companies have unknowingly fostered research islands, with analysis being done by individuals but not centrally captured and made available across the company. Still others have the data resident locally on hard drives, but are dependent on the institutional knowledge of their employees to know what data are available and where it can be accessed. The risk involved with these last two scenarios has been exacerbated by the volume of restructuring and layoffs that has resulted from the downturn of the past few years. E&P companies need to make concerted efforts to empower their exploration teams by providing easy access to internal geochemical data, supplemented by publicly available data, or data available for purchase as needed for a comprehensive understanding of a play. GeoMark supports the industry by providing the largest and most comprehensive geochemical dataset available in the market. Populated with source rock, oil, produced gas, mud gas and PVT data, the company’s Rock & Fluid Database (RFDbase) offers a robust dataset coupled with an easy-to-use portal that quickly allows users to view, query, and download geochemical data for further analysis. GeoMark further supports analytical efforts by allowing companies to load their proprietary data into RFDbase, enabling employees to utilize the features of RFDbase to access their company’s proprietary datasets. The discovery of massive unconventional plays like the Bakken, Permian and Eagle Ford are becoming rarer and rarer. The future of unconventional success will be found in smaller footprints. Exploration teams, now reduced in number through the downturn, will be increasingly pushed to make more detailed interpretations, faster. Energy companies must recognize geochemical data as a corporate asset and put the required digital capabilities in place to quickly respond to internal data requests. The companies that can concentrate their time on analysis and not data acquisition will be those that lead the next wave of exploration.